Few days ago i came across an article in TOI, it was about the favourite books of some cricketers. There i noticed a book which was liked by Virat Kohli and Shane Watson. I had seen this book in bookstores earlier but went against buying it. 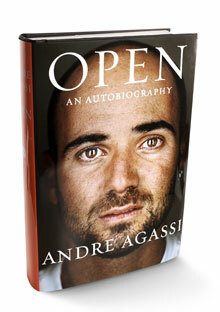 This time i thought, i’ll buy it, and i bought : OPEN – an autobiography by Andre Agassi. For people of my generation tennis means Roger Federer and Rafael Nadal. As much as their rivalry is famous in this era, the nineties saw the rivalry among Pete Sampras and Andre Agassi. Sampras, greater of the 2 players retired earlier. Agassi retired in 2006 winning 3 of his 8 grand slams after the year 2000. He has the 2nd most number of career ATP Masters Series Titles at 17. I have seen Agassi playing and the fact that he is married to the greatest women’s singles tennis player of all time Steffi Graph, drew me further into reading this one. The first thing which caught my attention was the cover of the book. It has just the face of Agassi staring at you, but something was there in that expression and the eyes, some sort of misery, honesty and pain – which made me look at the picture again and again. Moving on from this narcissistic theory, i read the first chapter titled THE END. Those 20 pages left me spellbound and i knew that a fantastic read is in store for me. Not surprisingly, the last chapter is titled THE BEGINNING. And in between you have Agassi’s life revolving around training, tournaments, Grand Slams, rivalries, relationships, marriages and soul-searching. Why i loved this book when i’m not a big tennis fan? Because throughout the book he describes his thoughts and feelings going through his mind so unbelievably well, that you will feel as if you are there in his place. And it is very interesting to read what is happening inside someone’s mind at a particular moment. I’m awed by the details of the things going in his mind specially during the matches. I wish and fear at the same time, if i could ever do that myself i.e. writing my thoughts out such vividly and honestly. This is not a review because reviews are supposed to be neutral. When i like something, i get very biased so i am only sharing what i think of the book. I HIGHLY RECOMMEND it for its brutal honesty and the amazing style with which it is written. worth a read maam...worth a read!! उन्हें शक है, मुझे यकीं !